Get it in writing! Avoid not getting essential paperwork or other items on a trade or when delivering a vehicle. 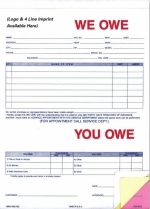 This form insures that the customer also knows what they OWE YOU! Printed in blue and red ink. 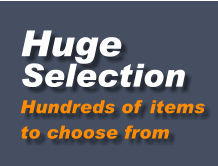 Minimum order is 500 forms. Forms are packaged in packs of 100. Custom loga and/or 4-line imprint is available imprinted in Red, Blue, Black or Green ink. Please select the color of ink to be used on your personalized Logo/Name/Address at the top of the forms. Please fill in the information you want to be printed in the space provided. Logo artwork, if applicable can be emailed to contact@dealerstockroom.com We will contact you and email you a proof for your approval prior to production. Please select Serial Numbeing or No Serial Numbering. If you would like serial numbering please enter the starting serial number you would like using the space provided.